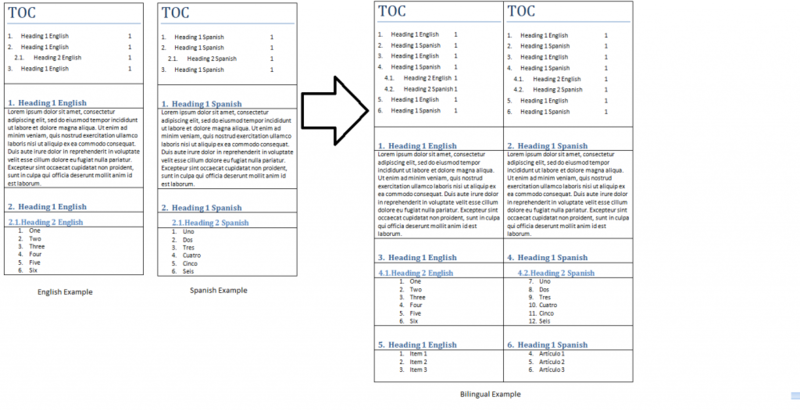 The situation is this: You have a document set up with styles, chapter numbers and a table of contents and you want to translate the document and present it in a side-by-side bilingual format. The best way to set up a bilingual Word document is to use a table. A two column table can handle even flow of information across pages without much trouble. 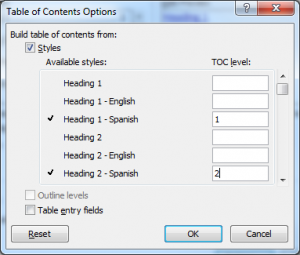 When forming a Bilingual Word Document out of 2 similarly formatted tables (in this example English and Spanish), you can see that both the English and Spanish Headings are populated in each Table of Contents. Also, note that automatic numbering tends to continue across columns. You can see that in the bilingual format, the Table of Contents is a mix of English and Spanish titles combined. The chapter numbers and the number lists are continued across columns. This is a small example, but consider this example in a 100 page document and you can see how this can become a major problem. In this post we’ll share some best practices to deal with this situation. Preparation is everything. Test out the layout in your source document to make sure you can anticipate formatting issues ahead of time. Here an example of a layout converted to a table format that spans half of a page. First we start by setting up the English or source document for translation. If you already have a document set up, convert the text to table separating rows by paragraph marks. You can remove the outline, but separating by paragraph marks in general ensures that the bilingual table will stay readable while maintaining an even flow in both languages. By testing out the text in table format, you can see how the text flows and make edits before going to translation. One thing that you can do in preparation is to set up your document in landscape mode and cover the table for about half of the page to simulate the flow of the copy. That will give you an idea of the number of pages. It also helps in figuring out any issues with formatting objects, such as images or tables that may take up too much horizontal space. You may want to set up your document in a linear format, much like we use with setting up eBooks because the horizontal space is limited. Here is the tricky part: working with styles. Styles help out with creating automatic table of contents for instance. However, Word cannot cover one unique index for each language by using the same styles. So, if you use styles to create a Table of Contents or want to use styles to format text of similar styles uniformly for each language, you’ll have to create separate style sets for each language. This tip assumes your English document is already set up with Styles. 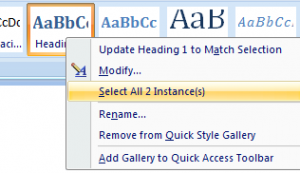 Even if you have not set it up with Styles yet, first set up your document using the default Heading 1, Heading 2, etc and set it up to your liking. Before translation, it’s best to create a unique set of styles for your English content based on the Heading styles that are in use. So, for instance, for Heading 1 style, select a header with that format and add a new style by clicking on “Save Selection as a New Quick Style” in the drop-down menu. Name it “Heading 1 – English”. Once you’ve created the duplicate style, go back to the Heading 1 in the Styles banner and right click and select “Select All # Instance(s)”. Once selected, you can change all of these to the duplicate “English” Heading style by simply clicking on that style in the banner. This sets up your English document with a unique style set that is a duplicate of the Heading styles that you have set up. We’ll use this style set to create the TOC that matches the layout of the English. However, it’s best to leave out the TOC altogether in preparation for translation. Table of Contents are not flexible in set up once created so it is best to create one unique TOC for each language based on the unique style set after translation. Splitting up styles per language is an important step in creating many style-driven features in Word. We’ll apply these steps to the translation as well to create a unique style set of the translation so that they cannot be confused. Separating styles can also help you with more advanced features that we will not handle in this post. Automatic numbering is a major pain in bilingual tables. Two main instances of automatic numbering that we will deal with are numbered lists and chapter numbers. Table of Contents are also numbered but we’ll have that figured out by separating out styles. So far, in our experience, it seems that numbered lists can be fixed after translation. However, chapter numbers are probably best dealt with before translation. Since we have set up a unique set of English Heading styles that are based on the standard set of Heading styles, we can start adding a new Multilevel List that is linked appropriately to each level Heading style. The method is very similar to updating styles that match a selection, as mentioned earlier. In this case, you’ll use the Multilevel List option to set up a number format for each Heading Level. Select a Heading 1 – English style in your text, go to the Multilevel List icon and select “Define a New Multilevel List”. Match the Levels to the Heading Styles and make sure none of the default heading styles are mapped to avoid any issues. So, Level 1 is mapped to Heading 1 – English, Level 2 is mapped to Heading 2 – English, etc. Format your list as you like and then hit “OK”. This should add a number to your headings. All you have to do now is to make sure that each Heading style is updated to match the selection and all your headings will now have a chapter number. The first thing to do with the translated document is to make sure that the translated content gets its unique style set. You can either revert all the styles to the default Heading 1, 2, 3, etc. styles by simply telling Word to select all Heading 1 – English styles (same method as earlier – right click on a style in the banner and select all instances of that style) and then changing the selection back to Heading 1, 2, 3 etc. Or, if you want to be meticulous in set up, you can create a new style based on the English styles and name it Heading 1 – Spanish, Heading 2 – Spanish, etc. for example. Then, it’s time to set up the Table of Contents. Since each document (English and Spanish in our example) has a unique style set, you can set up the TOC using only those styles that apply. In Word you can go to Reference and Insert Table of Contents (Word 2007). You’ll want to use the advanced options to select which Heading Style represents which TOC level. So, for the English you select the Heading 1 – English, Heading 2 – English, etc. and you select the Heading 1 – Spanish, Heading 2 – Spanish, etc. for the translated document. Sure, you’ll have to set up your Table of Contents twice, but that’s really the only way to ensure that your keep your TOC entries separate. Once the unique styles are applied and you’ve created your TOC, you can bring the tables together into one Word document. If you have already tested the layout in landscape mode, you should not have too many formatting issues other than maybe fixing a few list items that Word automatically adjusts when adding in a column of text. Numbered lists that run across columns (left to right instead of top to bottom) will have to be corrected by applying a unique number list to each individual column. If your numbered lists act up by continuing across columns, you will need to reset that numbering. Typically it is possible to just right click the first number of the numbered list in the translation and select “Restart at 1”. This works when your left hand column numbers run down first and then continues on the next column. This, however, doesn’t seem to work with numbered lists that runs up across the column. We found that sometimes Word interprets the numbering to continue one-for-one across the table as exampled in the image. In this case, the best option as far as we know is to simply remove the automatic numbering in the left hand column and applying it again, telling Word to number the list from top to bottom, rather than across the column. This may get time intensive and the only other way to handle this would perhaps be to remove the numbers from one of the columns at once and then applying a number list to mirror the other column. Spending a little bit of time up front to think through formatting issues pays dividend once you realize how much time could be wasted in making corrections afterwards. This is always our focus in formatting or typesetting translation. Keep in mind when asking for estimates for translation that it takes time to format and work through formatting issues, whether that is ahead of translation or correcting issues after translation. The formatting task can be a time intensive task and we do charge for that time. However, there are ways for organizations whose translation needs grow to look at best practices and turn them into processes that can save you time and money. Language and Design Readiness is one of our key areas of Readiness for getting organizations prepared for a more standardized and managed translation workflow that can help them move up the Localization Maturity Model. Interested to see where your gaps are? Take our Localization Assessment or Contact Us. Discussion about translation software compatibility which is useful for translators and other LSPs.